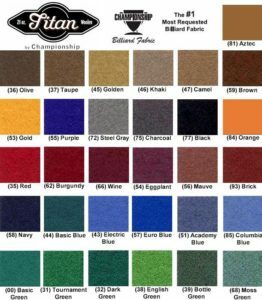 We will come out to your home and remove the existing felt from your pool table, replacing it with Championship Titan or Tour Edition. 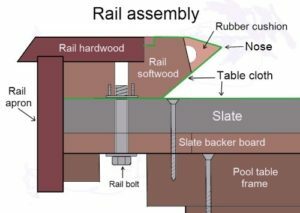 We will also double check your billiard table to see if it is level, if it isn't, we will fix it. Other brands of felt can be available. Championship happens to be the best and therefore we use them. Please click on the link to choose a cloth color. When you call or send e-mail, tell us which one you choose. We here at New Orleans Pool Table Movers guarantee all of our work. If you use our services and think that we did something wrong or that your pool table is becoming unlevel, we will come out to fix the issue. This offer is good for six months after your service. Our normal appointment times are at 8 or 9 am and 1 or 2 pm. There will be an additional $30 fee for any jobs that start after 5pm, Saturdays, or on Sundays. New Orleans Pool Table Movers thanks you for visiting our site.